Bowel management. It’s not necessarily the most pleasant phrase to ever be written, however, whether we like it or not, it is something that everyone deals with on a daily basis. What is bowel management? It is finding the right balance of regularity between loose stools and constipation. We are all familiar with the commercials featuring various kinds of yogurt promising to keep us regular and Oprah, back when she had a television show, was notorious for shouting with excitement when discussing the relief she felt after having a bowel movement! As a Registered Dietitian Nutritionist working in gastrointestinal, GI, oncology, bowel management is something that I encounter countless times daily. I see patients who have a GI diagnosis which includes cancers of the esophagus, gastro-esophageal junction, stomach, small bowel, pancreas, liver, gall bladder and colon. I see people while they receive chemotherapy and radiation, and more extensively, if they undergo surgery. I’m fortunate to work with a surgical oncologist who performs unique procedures including subtotal pancreatectomies, or the removal of part of the pancreas, liver resections, pancreaticoduodenectomies or a “Whipple” and partial or total gastrectomies which is the removal of the entire stomach. The GI system is where our food is processed from start to finish and inevitably, regardless of treatment, bowel management is essential for adequate care. When discussing bowel management it is important to distinguish between the two ends of the spectrum: the “d” word that many people do not like hearing, aka diarrhea, and constipation. Diarrhea is characterized by three or more persistent loose stools daily. In GI oncology patients, there are countless causes of loose stools. It is often a side effect of certain chemotherapy medications, radiation treatments, other medications like chronic antibiotic use, the disease location itself and surgical interventions. Not related to oncology, diarrhea is characteristic of several gastro intestinal conditions including irritable bowel syndrome, Crohn’s disease, lactose intolerance, other food allergies, various acute infections and pancreas exocrine dysfunction. Constipation is the opposite and is characterized by a lack of a bowel movement. Constipation is caused by being less active than you normally are, decreased oral intake of foods or liquids, chemotherapies, certain dietary supplements like calcium or iron and medications including those for pain and nausea. There are medications that are available both over the counter and by prescription from your physician to help manage these symptoms. Before taking any oral over the counter medication, contact your physician to discuss to see if it is medically safe for you to do so. As a dietitian, I am a big advocate for using food as medicine to alleviate symptoms in the body for bowel management. Of course, medications have their place and value however I often recommend that patients use certain dietary interventions to provide relief before exploring these options. To help manage diarrhea, it is important to eat smaller more frequent meals during your day versus two to three large meals. Why? Because if you eat a large portion of food at one time, this can cause the rapid transit of food from your stomach into your small bowel or from your small bowel into your colon which makes your symptoms worse. It is also important to decrease consumption of foods that are spicy, fried, greasy and very sweet for this very same reason. Alcohol is known to make diarrhea worse, so keep in mind current recommendations from the United States Department of Agriculture and consume no more than one drink per day for women and two drinks per day for men. One drink equates to 12oz of beer, 5oz of red wine of 1 ½ oz of hard liquor. It may also be helpful to eliminate gas producing foods including beans, lentils, chickpeas, carbonated drinks and vegetables like broccoli, cauliflower and cabbage. Foods high in sugar alcohols will also worsen your symptoms. Sugar alcohols, maltitol, mannitol, sorbitol or xylitol, are found in “sugar free” foods and have a laxative effect. You can also increase foods that are high in pectin which is a soluble fiber that helps to bind your stools. This is found in the flesh of apples and bananas and is also available in the form of banana flakes which can be added to various foods to bind. You want to avoid foods high in insoluble fiber. Insoluble fiber is the type of fiber that our bodies can not process and adds bulk to stool to speed up digestion. This is found in whole grains, raw fruits and vegetables with the skin, seeds, nuts and dried fruit. This is one of few times where I recommend choosing refined grains to help bind stools. Symptom management of constipation can be challenging as well. Hot liquids like tea, coffee and juice are known to stimulate bowel movements because they cause vasodilation which draws fluid into the colon and makes stools easier to pass. Caffeine is a natural laxative as well. Making sure that you stay sufficiently hydrated is essential for constipation prevention and something that I discuss frequently with post-operative patients. Individuals are at risk for a small bowel obstruction, also known as an ileus, which has significant associated risks including infection and re-admission to the hospital. Most individuals need approximately 30ml of fluid for every kilogram of body weight. There are exceptions to this rule, but hydration is an entirely different discussion which I am happy to have! Remember that fluids also include juice and decaffeinated teas, in addition to water. Individuals who are constipated are recommended to increase the insoluble fiber content of their diet and consume more whole grains and fresh vegetables. Post-operatively with complex GI patients, this varies which is why I provide unique individualized nutritional counseling. Like personalities, everyone’s bowel management strategy is different and none is alike. NuGo offers a fantastic product that I incorporate to help with my own bowel management and this is the Fiber d’Lish bar. Each bar is lower in calories, 130-160 depending on the flavor, but contains insoluble and soluble fiber. Always remember to drink sufficient water to help with the efficacy of fiber supplements because, if you do not, you might be even more constipated. As I sit here finishing up this discussion, I’m reminded of how lucky I am to be in touch with the wonderful people at NuGo. They continue to provide delicious products to help cover the entire spectrum for bowel management. 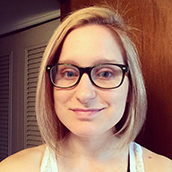 Amy Carion, RDN is a registered dietitian nutritionist working at the Van Elslander Cancer Center in Detroit, MI. Amy works with the Jerome F. Williams Gastic Cancer and HIPEC Programs with gastrointestinal oncology patients. She earned a Bachelor’s of Science in Dietetics from Michigan State University and then completed her Dietetic Internship at Youngstown State University in Ohio. 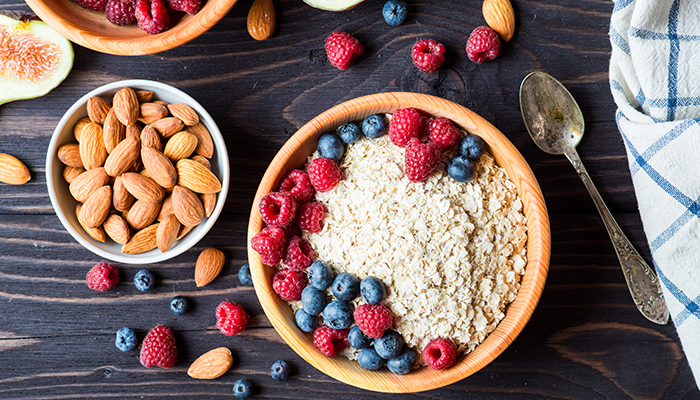 Amy provides patients comprehensive medical nutrition therapy as it relates to any nutritional needs from initial cancer diagnosis through survivorship. She also provides assistance for any nutrition related concern and is passionate about preventive care of chronic diseases. Follow Amy on Instagram and Facebook. This entry was posted in Ask a Nutritionist, and Health Benefits of Fiber.